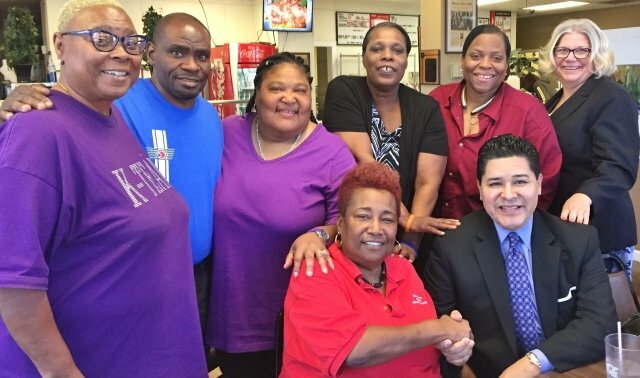 Members of the Houston Educational Support Personnel, an affiliate of Texas AFT, are celebrating a hard-won victory against privatization in how their school district’s food service program is managed. Last month, the Houston Independent School District cut ties with food contractor Aramark after 20 years. District officials didn’t say why they decided against renewing the contract, but HESP’s food service professionals have spoken out for nearly two decades about low-quality food and Aramark’s poor management practices, which have led to higher employee turnover and low morale. Like many privatization schemes, the Aramark contract has been on the ropes for years, as its claims of efficiency and cost savings didn’t hold up. For example, the food company lost $1.9 million in public funding during the 2011 fiscal year, according to the Houston Chronicle, after promising the city a $1.1 million surplus. That monetary loss alone violated the HISD contract, but Aramark also came under fire for turning free federal commodity food, like whole chicken parts, flour and potatoes, into highly processed and less nutritious chicken nuggets, frozen pizza and french fries. HESP members look forward to helping the district’s food service operations make the transition back in-house, Thomas says. By removing Aramark, the school district will be able to provide all of Houston’s students with better-tasting, more nutritious food and a wider menu.